Ending annual fee, PBOT declares Leaf Day Free! 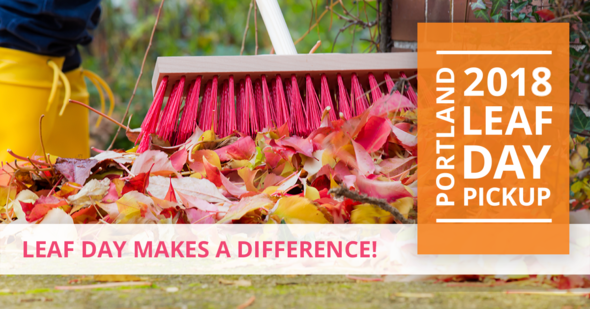 (October 2, 2018) Today, the Portland Bureau of Transportation announced that it would no longer charge Portland residents to pick up leaves during Leaf Day, the City's annual fall leaf clean up program. 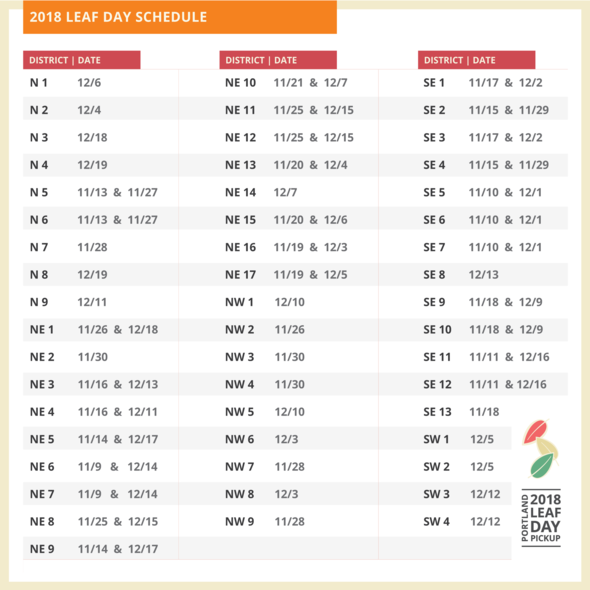 PBOT also released the 2018 Leaf Day schedule. The first day of this year's Leaf Day will be November 9th. For decades, the bureau has collected leaves and swept streets in designated Leaf Districts, locations that account for the vast majority of leaves that fall on city streets. In 2010, the bureau started charging a fee for the service to recover the city's costs during the Great Recession. "This year, we're introducing a big change to Leaf Day. We're making it free," said Chris Warner, PBOT's Interim Director. "We know the public appreciates this service, which keeps our streets safe for everyone and reduces the chance of street flooding. But the fee we started collecting in 2010 never met its goal of covering the city's costs. In addition, the cost of administering the fee have been quite significant, adding up to almost 20% of program costs. Finally, more and more Portlanders have opted out of the program over the years. Given all these factors, we decided it made financial and policy sense to return to providing this service free of charge." Portland's tree canopy covers a significant portion of the city. In autumn, wet fallen leaves can become very slick, creating potential hazards for people walking, biking, rolling or driving through tree-lined neighborhoods. Leaves can also clog storm drains and thus contribute to street flooding during heavy fall rains. 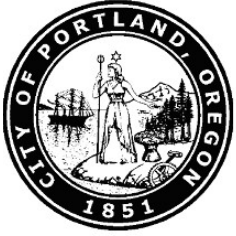 To help address these hazards, city crews have been removing thousands of cubic yards of leaves from Portland streets for more than three decades. During the years when PBOT collected a leaf fee, the revenue never covered the operational and administrative costs of the program. In fact in the last five years, leaf fee revenues have covered less than 50% of program costs. Starting with this year's Leaf Day, leaf removal will be funded through general transportation dollars, much like other services such as snow and ice removal, pothole repairs and roadside vegetation clean-up.